I've talked before about how I had a hard time dealing with Christmas no longer being the way it was when I was younger. The same goes for Easter. I'd always loved the traditions of dressing up for church (in a new dress, always!) and coloring two dozen eggs to be put into Easter baskets for the family, laden with marshmallow Peeps, Cadbury Creme eggs, jelly beans and Hershey's kisses. Even in college and afterwards, I would still go to my grandparent's home to color eggs with my grandfather and later my niece. Last year I was unable to go home but I borrowed a child (my husband's best friends' son) and colored eggs and made Easter baskets... but it just wasn't the same. Regardless of what I do, the significance of the day remains the same. Jesus died on the cross for my sins and rose again whether I color eggs and go to church or play video games all day, but I still want the day to be special. This year, I decided to not try to recreate my childhood and do something completely new. 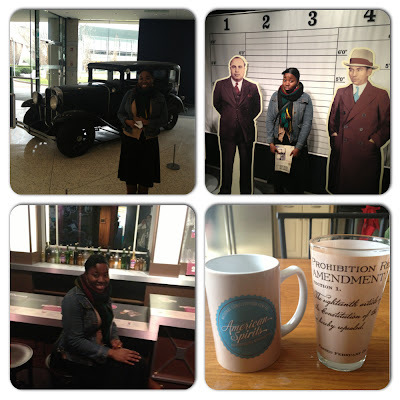 Hubs and I went to breakfast and then took a trip down to the Constitution Center to see the "American Spirits: The Rise and Fall of Prohibition" exhibit. +The Ku Klux Klan was pro-Prohibition as a means of keeping African Americans from drinking. +The Suffrage movement came directly out of the Prohibition movement. Women who were working towards the Eighteenth Amendment realized that their power was limited since they couldn't vote, so they worked for voting rights as well. I had a good day. Without any of the things I felt like I "needed" for Easter to be Easter. I suppose I'm becoming more and more adult as time goes on. Growing up IS a funny thing... I feel like we just keep growing up forever, no matter how old we get. My family hasn't really celebrated Easter in awhile (aside from the traditional big meal) so unlike Christmas in a new location away from family...I wasn't bothered much...and ended up having a pretty good weekend aside from being sick. I went over to the inlaws to color eggs and went over for dinner on Sunday. It was really great. The only thing I did miss was the traditional basket of candy (yes, my parents did that up until we moved out!) but today I picked up a few bags of chocolates so I'm satisfied.